It’s been quite a while now that I have wanted to start blogging. Specifically starting a blog for FHA but I haven’t been so sure how much I wanted to be the face of my own brand. There are a lot of clothing lines that we have no clue who the owner is and I didn’t feel the need to be in the light. We are still new and I wanted the brand to be its own thing. As we move forward I am beginning to realize that although I don’t have to be in every post and every photo, I do have to play a larger role in representing the company. I guess I’ve been apprehensive because I never created FHA for my own “fame” or whatever you would consider it. So I guess I’ve just struggled with tying in a blog for FHA that’s written by me and from my own point of view. I mean, what does anyone care what I have to say ha-ha. Well here it is, our first post. I have a lot of plans for this blog in the future, I hope to explain the idea behind the brand and why it means so much to me, why we ever started and where we hope to be. We will be working on a video series and articles to help with athletic performance of all types. These will be written and submitted by many authors in all realms of the fitness world as well as random “all things gym” type of rants from yours truly. If you are reading this blog I want to thank you from the bottom of my heart for supporting us here and now, at the ground level. So I’ll start here with this, our first “limited edition” tee shirt. Starting a clothing line has been a long time goal of mine, along with that goal I have always wanted to use this platform to help raise awareness and funds for a few things on a larger scale than I could do alone. 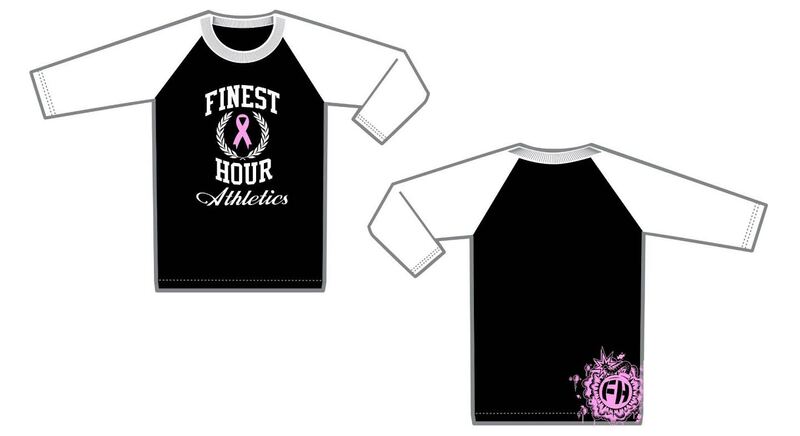 Ok, now here we have it… Limited Edition Baseball tees to help raise funds and awareness for breast cancer during October (National Breast Cancer Awareness Month). I’m sure we all know someone who’s life has been affected by this horrible disease whether it be a friend, a family member, or a friend of a friend. For me, it was my Nana who battled it out with breast cancer while I was in Jr. High school. She was fortunate enough to beat the disease but man it wasn’t easy for us to watch and it damn sure wasn’t easy for her to go through! I was living with her at the time and was able to watch first hand just how tough of a battle this can be. Unreal. We have nothing but love and support for everyone out there fighting this fight, the utmost respect and admiration for those of you who have survived the fight, and of course honor those who have been taken from us too soon as a result of it. Making a product to help raise money for this cause has been on the top of my list since day 1. When it finally came time to make it happen my first instinct was to contact my grandmother and ask her if she had any experiences with organizations or groups that she could recommend we donate to. This is exactly how I chose to donate a portion of each sale to the “Look Good, Feel Better” program. A program who held a workshop she attended and loved while she was undergoing treatment! Check out who they are and what they do here. I hope this helps you all understand why these shirts mean so much to me and why we are making them. Thank you again for your support of FHA and for reading this!